While answering media charges of a scandal, the politician responded with a plea, “I have no recollection of those events.” It is yet another attempt of a public figure to apply a strategy called “plausible deniability.” This is when individuals try to create a personal safety net for themselves by seeking to convince others that they have no knowledge of the events in question. Someone else usually gets the blame and becomes the scapegoat. Sometimes Christians have their own kind of plausible deniability. We claim ignorance of our wrong behavior: “Oh, that’s not in the Bible, is it?” “Is that really what God meant when He said that?” “That’s not for today, is it?” That’s called rationalizing. “Everyone else is doing it.” “Well so-and-so said it was okay.” That’s blaming others. What we need to understand completely is that God knows the truth. And I thank God for our scapegoat, Jesus Christ. The Bible tells us in 1 Samuel 16:7, But the Lord said to Samuel, “Do not look at his appearance or at his physical stature, because I have refused him. For the Lord does not see as man sees; for man looks at the outward appearance, but the Lord looks at the heart.” This is true whether the heart is pure or if it is corrupt. We may fool others who see us only on the outside, but God sees the reality of our hearts—whether good or bad. God sees our motives and He tries to steer us away from trouble. The unfortunate thing is that our flesh often wins, and that should not be so. David lost one of these battles of the flesh. I admit, in preparing this message I thought, “God, the people in our church are pretty good folks. Is this message necessary for them? I get why you want me to hear it. But He said, “yes”, he said yes about you folks, because sin is sin. The devil hasn’t stopped his attacks, and repentance is necessary—repentance is not a single, one time event. It is an ongoing practice (that’s not an excuse, but a fact). So let’s see the outward expression of David’s heart of repentance. Have mercy upon me, O God,?According to Your lovingkindness;?According to the multitude of Your tender mercies,?Blot out my transgressions. 2 Wash me thoroughly from my iniquity,?And cleanse me from my sin. 3 For I acknowledge my transgressions,?And my sin is always before me. 4 Against You, You only, have I sinned,?And done this evil in Your sight—?That You may be found just when You speak,?And blameless when You judge. 5 Behold, I was brought forth in iniquity,?And in sin my mother conceived me. 6 Behold, You desire truth in the inward parts,?And in the hidden part You will make me to know wisdom. 7 Purge me with hyssop, and I shall be clean;?Wash me, and I shall be whiter than snow. 8 Make me hear joy and gladness,?That the bones You have broken may rejoice. 9 Hide Your face from my sins,?And blot out all my iniquities. 10 Create in me a clean heart, O God,?And renew a steadfast spirit within me. It is wise, to humbly confess our faults to the Lord. He desires that we admit the truth. 5 Behold, I was brought forth in iniquity,?And in sin my mother conceived me. He was the son of his father through the spoils of war. He was a half brother to Jesse’s seven other sons, who were full heirs to their father’s estate. 6 Behold, You desire truth in the inward parts,?And in the hidden part You will make me to know wisdom. Maybe David was not a mistake and that truth could dwell in him. The only way for David and us to escape our sin and restore our fellowship with God or to grow is to acknowledge and confess our sin to God. Dear Lord, be merciful to me; My sin has grieved Your heart; strengthen my resolve to live according to Your Word. O Lord, help me to depart from evil and to seek what is good and righteous, to walk according to Kingdom principles. 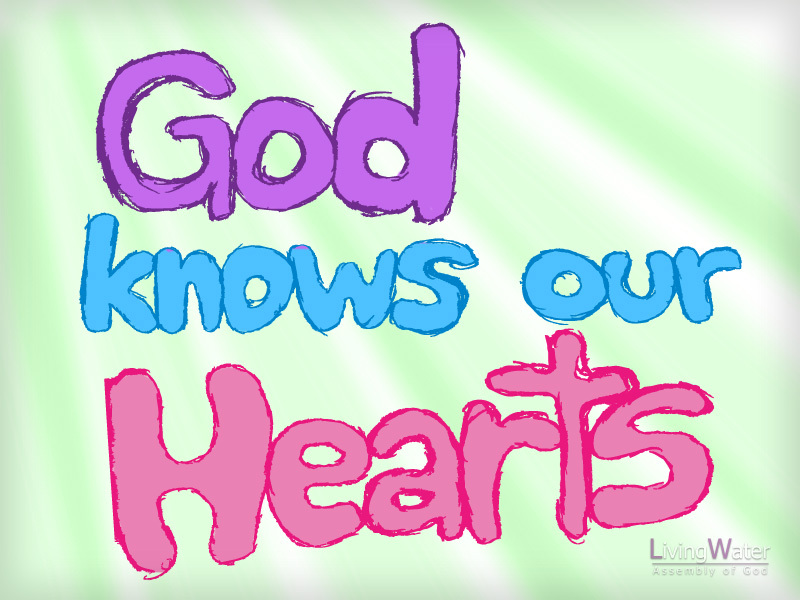 Remember, in all we do we may successfully fool others, but God Knows Our Hearts. The weakness in my Christian walk is that I believe, if I do my best with a little of God’s help I can overcome. I fail to realize that God wants my total surrender. I can do nothing of myself; my place is to worship God, and to believe that He will work in me every moment. I must stop waiting for God to give me a little help, and follow Him.